History, commitment and service are just some of the things that set us apart, but all these mean nothing if they're not paired with the best products. Our custom Garage Doors are an excellent example of how we provide our customers with unique products that can complement their stunning designs. When it comes to these doors, your creativity can be the start of something truly spectacular. We are proud to provide our customers with smart and innovative energy solutions and are firm believers in practising what we preach. Our head office and warehouse in Darra is powered by 363 solar panels and it's just one of the ways we are contributing to a more eco-friendly environment and the future of sustainable energy. We see a future where every new home can power itself and are proud to be well on our way towards making this a reality. When it comes to choosing your external cladding, you want to make sure that you pick the very best available. Considering the regular wear and tear a home experiences, including extremes of heat and intense elements, it's vital to focus on products with integrity. That's where Ceraclad® comes in. Developed in Japan, Ceraclad® cladding is a pre-finished, ceramic-coated cladding option that gives you the triple benefits of easy maintenance, superior safety, and a sleek aesthetic. With over 50 years of professional experience with world-class exteriors here at Stoddart Group, we feel confident standing behind the benefits of Ceraclad®. We understand the importance of aesthetics when it comes to a home's exteriors. The outside of a house is what faces the rest of the world: you want it to be stylish, sleek, and modern. Ceraclad® offers versatile design options that can fit well into anyone's concept. Interested in a more classic, wood look? Ceraclad® offers several ranges of wood-toned panels that emulate those classic walnut and oak finishes. With a wide range of colours and textures, there's a Ceraclad® panel that fits every design vision. Ceraclad® can be used to design and develop a variety of sleek exteriors to fit the vision for any new home. And with Ceraclad®’s 30 Year Colour Test, you know you're investing in a quality look that lasts. Once installed, you'll benefit from the extra convenience of Ceraclad®'s self-cleaning panels. This self-cleaning mechanism is based on Ceraclad®'s ability to trigger an oxidation process when exposed to sunlight. Also known as a photocatalytic capacity, this means that all the sunlight shining down on your exteriors will work in your benefit. The oxidation process decomposes dirt and grime that naturally accrues on your home, with no extra effort on your part. panel is so sophisticated, it's used in Japanese hospitals to eliminate germs and viruses. We're proud to stand behind products that fit our standards for safety. As we mentioned before, the photocatalytic coating is so safe that it's used on the walls in Japanese hospitals. The ceramic coating is a safe and non-toxic material that's in cookware, tableware, and biomedical implants. In addition, Ceraclad® offers protection for you and your family. It's code marked up to BAL 40 for bushfires, which means you can feel safe with Ceraclad panels whether you're in the city or out in the country. Remember that oxidation process that makes Ceraclad® self-cleaning? Well, this photocatalytic property also makes for an environmentally conscious product. Every 80 square metres of Ceraclad® produces the same amount of air purification as six poplar trees. In addition, the panels are made of 50% recyclable materials, making it the ideal product for the environmentally conscious consumer. Ceraclad® not only looks and performs great, it's also backed by the Stoddart Group Seal of Approval. With over 50 years of experience, 38 branches, and 2000 contractors, we know a great building material when we see it. And we're so impressed with Ceraclad® that we've secured the exclusive Australian distribution rights. If you're interested in installing panels that offer sleek design, low maintenance, and peace of mind, contact us today. Introducing Stoddart's Health, Safety and Environment Risk Group. The group caught up last week to discuss all things health and safety and talk strategy for the year ahead. Safety is a fundamental part of what we do and we strive to ensure a safe working environment for all involved. To have a team like this is a great asset to our business and round-table discussions like these ensure safety is more than a department, it's a company-wide commitment. Always thought it was hard to work on a steel frame? We chatted to electrician Lachlan about his experience with steel frames. We are on a mission to bust the myth that steel frames are harder to work on for follow-on trades. It's a common misconception that steel frames are harder to work on for follow-on trades. To bust this myth we've been speaking with tradies about what it's like to work on a Stoddart Steel House Frame. First stop - E&K Plumbing. Solar energy is in the news a lot - and often touted as the future. When building a new house, builders and buyers should consider whether to add solar panels to new construction or not. The fact is energy prices are rising and more and more people want to benefit from solar power. 1. As more and more people want solar panels, the value of a home with solar increases. The market has moved towards solar acceptance and the product is in demand. This is particularly true in Australia, where more than two million households already have a solar system. 2. When solar is installed at the time of construction, the entire home can be properly designed to take advantage of solar power. You can, for example, angle the home on the lot to give a nice expanse of north-facing roof. You can also plan roof layout and landscaping to prevent shading and ensure that there is space for PV inverters and other equipment. 3. It is cheaper to install solar power systems during the build phase. 4. Builders offering solar stand out from the crowd - it shows a company that’s environmentally savvy, knowledgeable, and forward-thinking. 5. The government pays for some of the system through rebates plus your customers benefit from feed-in tariffs. 6. The law may one day require it. Although Australia's Renewable Energy Target has not gone as far as to start mandating solar panels on new construction, San Francisco has already started requiring rooftop solar on new construction and France has a law that partially mandates it. Some smaller cities are also doing it - and it is not at all impossible that jurisdictions in Australia will follow suit. Builders who are ready for this will be at a major advantage compared to those who are not. 7. Electricity rates are rising all the time. Even without feed-in tariffs, a reduction in payment will be attractive to new home buyers, especially if they are educated about the cost comparison between solar systems and continuing to get your electricity from the grid. It typically takes five years to pay off the initial investment, but because it is integrated into the price of the home, customers will notice a return faster than if they simply bought a system. 8. Solar panels can be more reliable for people who are at the edge of the grid than grid power - and need no fuel. If you are building in a location where most people have generators solar panels can, at least during the day, reduce or even eliminate the need for a generator. 9. By building the system into the house at the start you can ensure that the roof type is correct. You can avoid slate roofs (which tend to crack under the weight) and asphalt roofs (which tend to need to be replaced or repaired before the panels do, increasing expense). 10. With battery prices on the way down it makes sense to install a large solar a solar system on your new home, at a significantly lower cost than after construction. This will ensure that your new home will be battery ready when batteries become more affordable. In our latest Q&A we spoke to Sydney Regional Manager Chris Hoult. Chris was one of our subcontractors before he came on board as a supervisor in 2010 and has worked his way up through our business. His knowledge of the Sydney market is second-to-none and his focus on customer satisfaction centres around his ability to predict what a customer wants before they have to ask. In our latest video, the General Manager of Steel House Frames, Wayne Dixon, shares his Stoddart journey. Wayne talks about the great growth potential for steel house frames in Australia and how he has enjoyed his time working for the Stoddart Group. Backed by 55+ years of success, Stoddart is now leading the way with timber to steel conversion with excellent products and industry knowledge. In our latest Q&A we spoke with Michael Trasy. 20 years ago Michael started as a trainee estimator in Brisbane. Since then he's held a number of roles in various states and he is now the State Manager for Building Products NSW. Under his leadership the NSW business has seen impressive growth. Michael's journey with Stoddart Group is just one example of how people can grow within our business. Throwback to this impressive progress shot of Stoddart steel framing at The Manhattan Terraces in West End, Brisbane. Built by Condev Construction and featuring 80 townhouses we were able to commence this project ahead of schedule and exceed our client's expectations. Our steel framing business offers full project management covering everything from initial design right through to installation onsite, we even do the structural component meaning you only need one supplier for your framing needs. We love seeing solar as a standard inclusion on new homes - we're proud to be working with Valeco Homes who are putting a 2.2kW Stoddart Energy System on every new home and have a 5.5kW as part of their Extreme Value promotion. Thanks to Miguel Ramirez and the team at Valeco Homes for a great promotion. From an idea to reality. We often talk about how the garage door is the biggest opportunity to make a statement with a home's facade and the proof's in the pudding with our latest custom garage door for Welsh Building. Designed by the home owner and made a reality by our team, this custom Western Red Cedar carriage panel door is truly a piece of art. The finishing touches, replica hinges and handles and a stunning oil finish take an already stunning door to the next level. Below you can see the process from the owner's original idea right through to an installed door. If you're interested in a custom garage door for a new home, contact us today. A home is a big investment, and it's worth every penny. After all, it's your personal space, your protection, and the setting in which you raise a family. Naturally, homeowners want to use the highest-quality building materials to ensure their home will last as long as they want to live there. Or if your home is an investment, you want to protect it for the long term and not be worrying about ongoing costs and repairs. There's a reason skyscrapers are built of steel. It's incredibly strong and durable. Over time, sunlight, humidity, water, temperature changes, and pressure can cause wood to bend and rot, which again can damage the structural integrity of a home and lead to additional problems with the building. For example, you might find a door or a window that starts to stick because a warped beam is putting pressure against the door or window frame. Steel doesn't warp. See above: a stronger building is a safer building. As another safety bonus, steel frames won't burn in the terrible event of a fire. With steel, we can achieve straighter lines and more precise angles than we can with wood framing for greater aesthetics and structural soundness. Steel allows your home to maintain its shape over the long term. Wood grain varies throughout a piece of lumber. That makes it beautiful for furniture, but the naturally occurring weaker areas aren't ideal for a building frame. Steel is consistently strong from one end to another. This is the reward you reap because of the benefits listed above. When your home is less prone to damage, you're less likely to be faced with costly repairs and upkeep. Since you don't have to worry about termites or anything else destroying your frame, there's no reason to treat it with chemicals you really don't want anywhere in your home. Along those eco-friendly lines, steel is recyclable. In the unlikely event that you ever tear your house down and start over, that steel framing can be used again, which is good news for the world we live in. Finally, because of the controlled conditions under which steel is produced, waste is limited. Though steel framing may cost more than wood, it pays for itself fairly quickly. You save money every year on maintenance and you can't insure against termite damage so repairs on timber will be out of pocket. Building a home is exciting because you have so many choices. When it comes to framing, the obvious choice is a steel frame from the Stoddart Group. When you're building a new house you'll get the chance to make it your own during the colour selection process. When you start choosing upgrades, you usually look first to the inside. You want more functional storage space, granite or marble bench tops, or new hardwood floors. You probably aren't even thinking about your garage door. Let's face it: garage doors are overworked and under appreciated. Before you say, "But it's just a garage door," take a look at how a garage door upgrade can make a big difference for your home. You want your new home to stand out and it feels good to live in a clean, attractive house; keeping your home up-to-date makes the entire neighbourhood look good, too. A garage door is a major feature and truly is the gateway to your home. It takes up far more space than your entry way and can draw more attention than even the best landscaping. A beautiful garage door can change the look of your entire home. Choose from a variety of styles and colours to find a door that perfectly suits your house for a modern, polished look. Four door profiles featuring classic and contemporary designs. Window options (Regency and Georgian profiles only). You take time and effort to choose a beautiful front door, to tend your lawn, and to keep a fresh coat of paint on your exterior. The same care should apply to selecting a garage door, and we're happy to work with you to customise it to your specifications. And when it does come time to sell your home, that top-of-the-line garage door adds value to your house and draws attention from potential buyers. On the typical home, the garage door is used more than the front door, which means you're putting a lot of miles on it. You want a high-quality door and expert installation. Our in-factory installation of struts and hinges means higher quality and better performance for years. The Stoddart Group garage doors feature a patented "Pivot-Lock" hinge system, which is installed in the door panel at the factory, allowing for greater control and precision. Our “finger safe” doors are uniquely designed to prevent your fingers from getting pinched or stuck, which is an especially important feature if you have children. What if you could get a garage door that's 40 percent stronger than your current door? Our "Strong Strut" technology is fully bonded to the top and bottom of the door panel for better load distribution and a much stronger door overall. The rollers allow for smooth, quiet door operation. There's no metal grating on metal as you open and close the door, so you're less likely to disturb (or be disturbed) when opening the garage door early in the morning or late at night. Don't overlook your garage door when it comes to upgrading your home, not only for appearance, but also for safety, reliability, and durability. 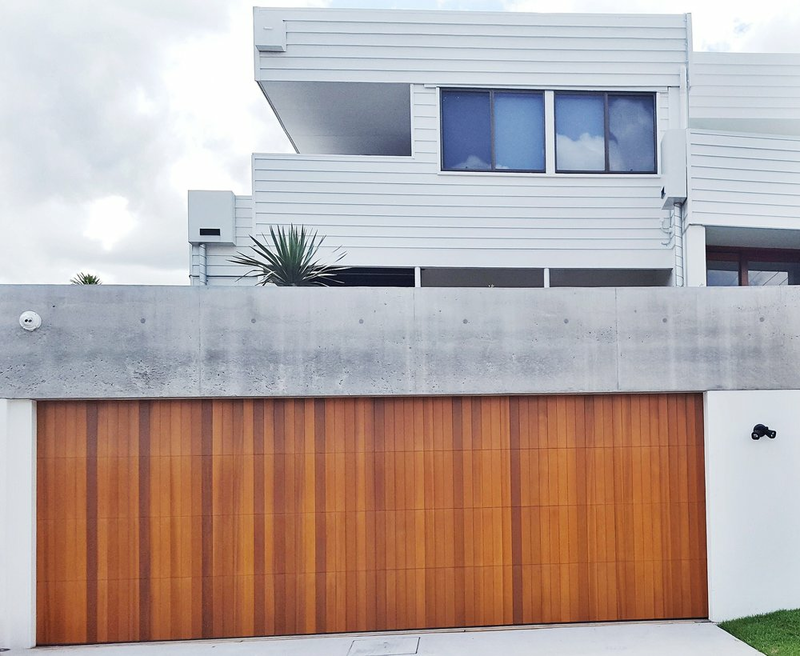 From the timeless beauty of natural timber to the sleek, modern look of aluminum mesh, there's a garage door that will suit the style of your home and your personal preference. Whatever you envision for the front of your home, the experts at the Stoddart Group can make it a reality. The Stoddart Sigma roof truss system is a truly unique product which offers a number of major advantages to the residential home builder and specifier. We spoke to engineer Cam Secombe about the truss and what makes it the best truss on the market. Simonds is giving away a Matt Black Jeep! We welcomed the Simonds Homes team and their Matt Black Jeep at Stoddart Head Office in Brisbane to celebrate their latest promotion. Simonds have partnered with Colorbond to give away the Jeep to one lucky purchaser, so not only do they get their dream home with the best roof but a brand new car to put in it. While they were visiting we had the chance to catch up with General Manager Queensland, Kaine Finn, about the promotion and why they partner with Stoddarts. In the latest edition of Stoddarts Q&A we spoke to our National Sales Manager, Aaron Morris. Aaron has been in the industry over 30 years starting as an apprentice roofer as a teenager and has been an instrumental part of the Stoddart team for over a decade. Aaron's product knowledge is exceptional but it's his passion for people that drives everything he does. Aaron answered questions including how he manages a team spread across over 3000km and the best book he's read. Transcript: The best part of my job is the interaction with the staff and the customers who challenge me every day to be a better business leader. How do I manage a team from Cairns to Warnabull? It's about employing the best people, giving them the best tools and empowering them to be the best in industry. How are things changing for sales teams in 2017? I think it's about enhancing the sales team in the social and digital platforms to deliver on our customer expectations. Today it's all about Facebook, LinkedIn and Instagram and we need to ensure we're working with our customers to deliver exceptional results. What's the best book I've read? Anything by Richard Branson. Here's a gentleman that epitomises customer service. He has a saying if you treat your staff right they'll treat your customers right and I think that's the culture we have at the Stoddart Group. What am I most excited about in the next 12 months? Innovation and sustainable solutions. It's keeping ahead of emerging trends and challenging ourselves every day to deliver what our customers want. In our latest Q&A we spoke to John Hasselmeyer, Manager for Garage Doors, about all things Stoddarts. John is passionate about two things, doors and people and this is evident in everything he does. John always has a smile on his face and a chocolate in his hand.